The ADDIE Graphic Recording is a studio map illustrating the ADDIE instructional design process. As an instructional designer, I’ve always thought mapping out the ADDIE process would be a perfect blend of both my professional focuses and a fun visual way to overview the guide to creating instruction. So here is a high level overview of the ADDIE framework in five distinct color coded phases. Looking at the finished map, it is so interesting to me how this visual emphasizes the importance of the first two phases – Analysis and Design. Spending time doing a thorough needs analysis is so critical to uncovering a true understanding of the client’s business needs, and where they believe the skill/knowledge/attitude gap lies. If a needs analysis is done correctly, in some instances it may emerge that training isn’t necessarily the best solution to the problem. Design is another step in the process that requires a huge amount of time and professional questioning. Learning objectives need to be observable and measurable. So the question is, “What will the learner be able to DO?” The learning objectives will emerge and become the scaffolding for the training design. Once the design is thoroughly mapped out in the storyboard, development begins in whichever mode will be most effective based on content. Then the training comes to life during the Implementation stage. Evaluation gives the designer feedback and refinements and changes are implemented as necessary. The circle continues. 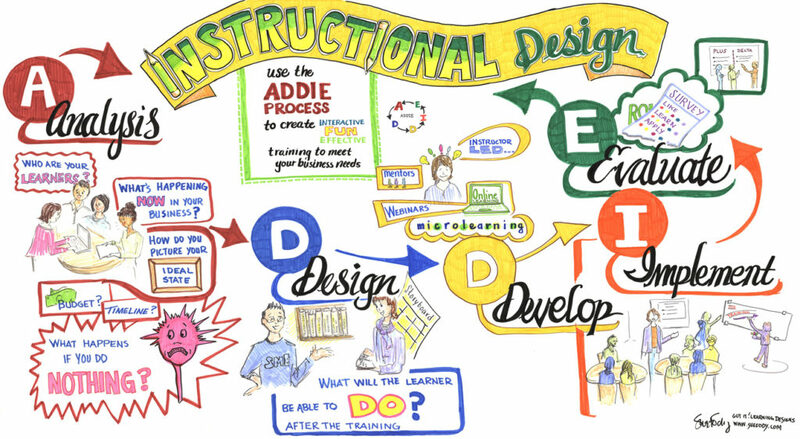 This graphic recording is a great reminder for all us instructional designers of the emphasis and importance of the first two steps of the ADDIE process. As fun as it is for us to jump into the development of the training, preparing is critical to the production of truly effective training.